The Hell's Belles, a group of female superpowered villains, appears for the first time this issue. Unfortunately, his story (up through next issue) represents their only appearance, which is a shame, because they seem like a fun group of characters with some interesting powers/looks. There's potential there, far more than with the similarly "more or less one-and-done teams of X-Factor villains" Nasty Boys. 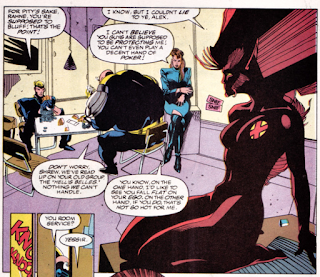 The leader of the Hell's Belles is revealed to be Cyber, whom Peter David created for the first Sam Keith illustrated Wolverine story in Marvel Comics Presents. As a kid, I always assumed Cyber was a long-standing member of Wolverine's Rogues Gallery at this point, not realizing he'd only made one prior appearance before this issue, and that his presence is down to the fact that Peter David created him. 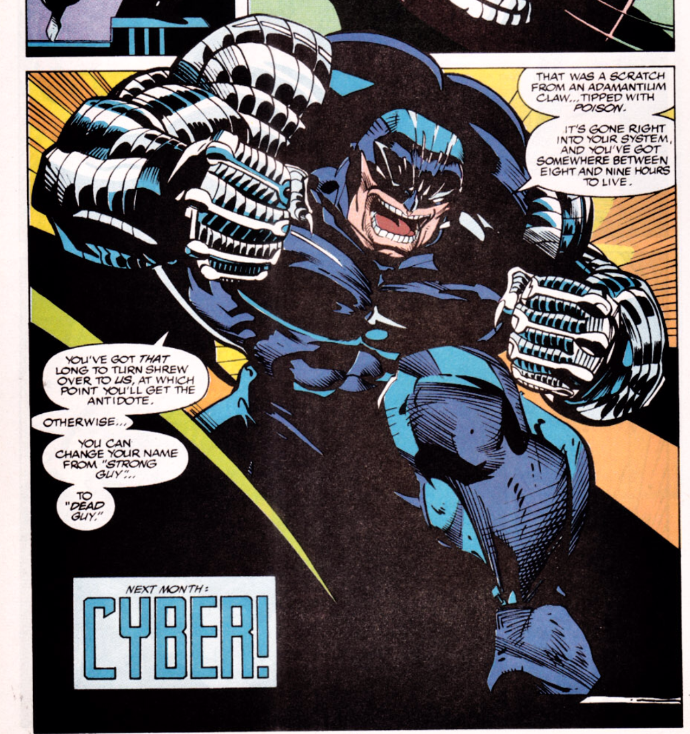 It's also established that Cyber was the one who attacked Lorna last issue. As a result of Cyber's attack on her, Lorna's jaw is wired shut, a condition she'll be stuck with through "X-Cutioner's Song". 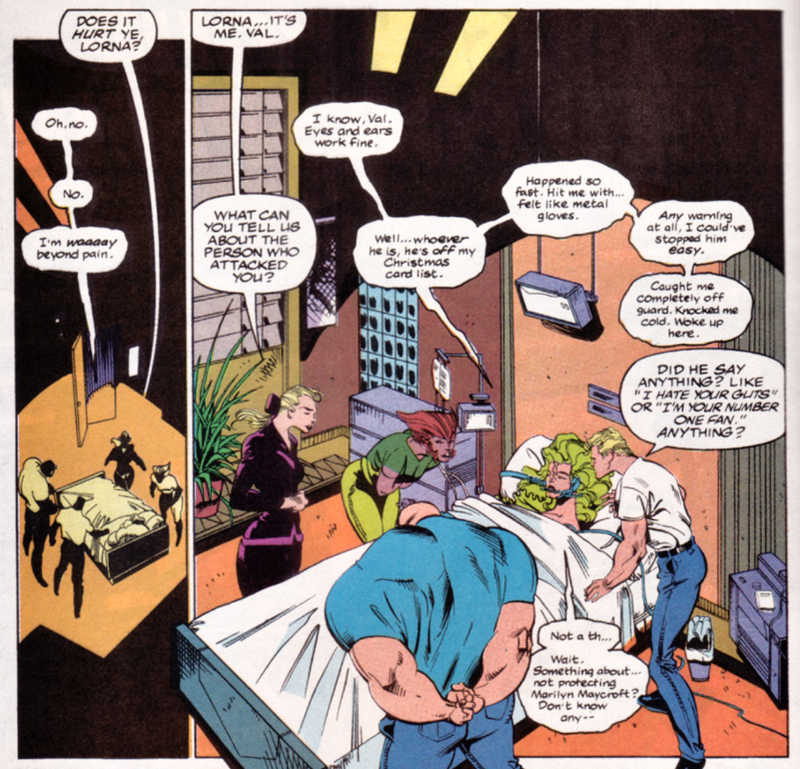 She jokes that at least it'll help her lose weight, continuing the "Lorna body image issues" subplot. 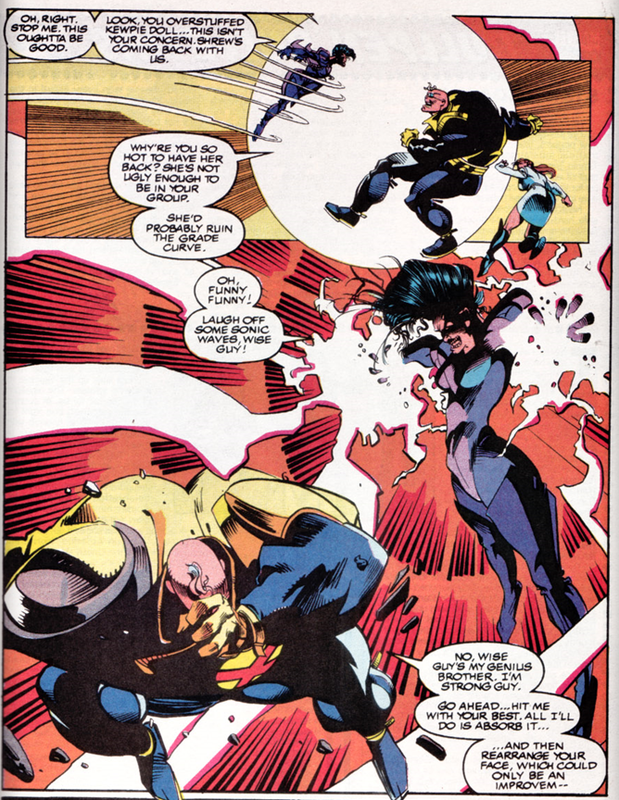 Lorna notes that Cyber's attack was sudden and fast; had she even a second of warning, she obviously could have stopped it given his metal arms. Jamie is able to open a locked door by fitting a finger far enough under the door to materialize a dupe on the other side. Upon meeting Hell's Belles member Vague, Strong Guy complains that his name isn't any dumber than that. This issue opens with Rahne dreaming about a Waynes World spoof called "Rahne's World", with her as Wayne and Havok as Garth oogling Polaris. The idea for the spoof is credited to Myra David, who I believe was Peter David's wife at the time. As part of that spoof, we of course get a "NOT!" 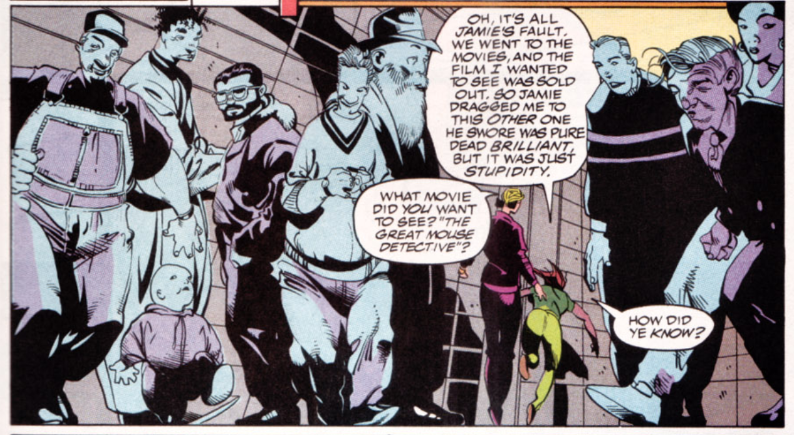 joke (ah, the 90s), as well as a dig about how the Brood are Aliens ripoffs. Havok is referred to as the one in "the Alien Legion" headgear. 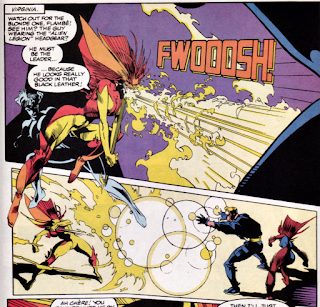 Alien Legion was an Epic series that Larry Stroman illustrated before X-Factor. When Briquette calls Guido a wise guy, he responds that he's Strong Guy; Wise Guy is his genius brother. When Briquette introduces herself by saying "I go by Briquette", Strong Guy responds that he buys briquettes whenever he wants to grill steak. 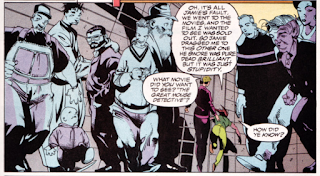 There's another few panels of what's become a Stromanism, in which the focus of a panel seems to be on a group of people, many with distinctive porportions, instead of the main characters, such that I'm left wondering those people are meant to be in-jokes or references to specific people. Rahne's infatuation with Havok is so strong that she can't even bluff to him while playing poker. 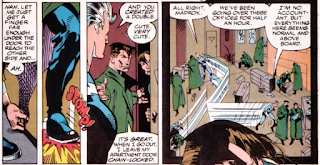 A letter writer asks if Quicksilver is officially part of the team, since he doesn't wear a uniform and wasn't in the team pin-up in issue #75; the response assures us he is. Peter David continues to strike an entertaining balance between plot, characterization, and humor. With the Rhapsody storyline (which I was less enthused about last issue) relegated to the realm of subplot for this one, the Hell's Belles plot takes center stage, and it's a lot of fun. This isn't X-Factor being proactive, per se, at least not in the way X-Force means it when they use that word, but they're also not just sitting back waiting for a villain to strike. 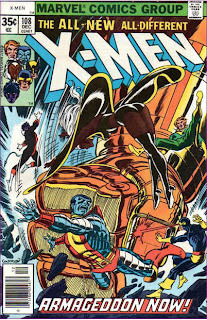 Protecting a witness in Federal custody is another smart use of the government-sponsored mutant team, and the way the team is spread thin (with Polaris in the hospital and Madrox & Quicksilver on another mission) helps ratchet up the tension when the Hell's Belles attack. And the Hell's Belles themselves are a lot of fun, with Briquette in particular featuring both a clever power and a unique look. This isn't groundbreaking, revolutionary stuff, but it is well drawn, smartly written, and an immensely satisfying example of a "typical" All New X-Factor story. Next week: the X-Men find Longshot in X-Men #10, Excalibur finally interacts with one of the X-Men in Excalibur #52, and Wolverine suffers a loss in Wolverine #57. 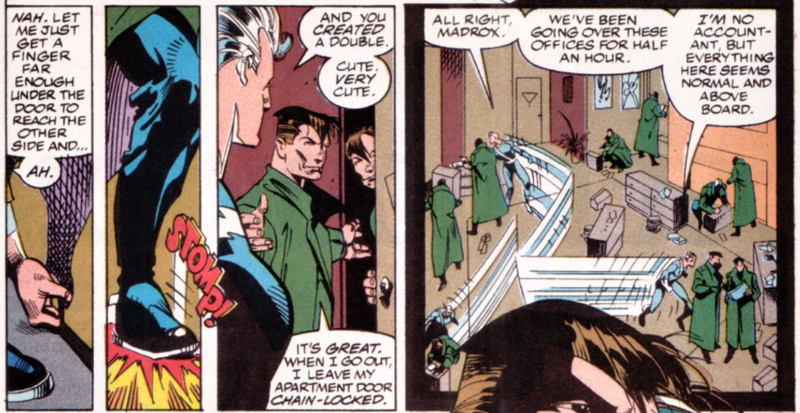 I remember having the same reaction after issue 79 being so drab. This one was was a great return to form, and I was obsessed enough with "Wayne's World" at the time that they pretty much had me at the opening joke. 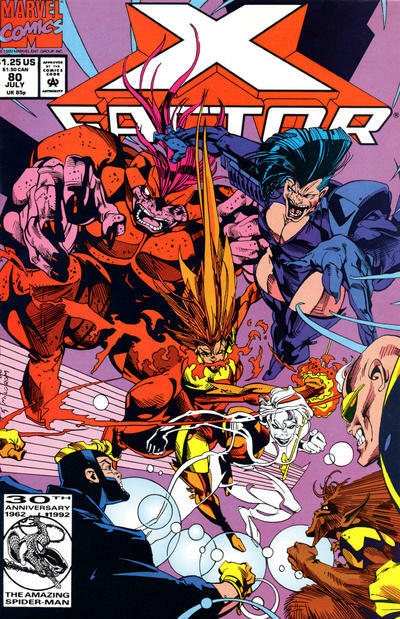 I'm saddened by the lack of discussion around X-Factor! While it wasn't as exciting as the other X-books at the time, it was certainly consistent and the characterization was consistent. I think Shrew and Briquette are the only Belles to keep their powers. Shrew at least has a different mutation and she does get a nice little character arc over this issue and the next. I'm surprised the current X-office hasn't tried to revive the government sponsored team (or an Avengers version since they're the big franchise). The political commentary in this book is more appropriate than the way it gets shoehorned into everything else and the concept is still ripe with possibilities. Those crowds of Stroman's really are... something. Pretty good one, too, from what I recall, although I haven’t read it all (nor any of it in quite some time) and I believe most of that was from before Stroman came aboard.